Merrell Adventure Run 2013 is an annual trail run event that was held on April 27 at Pintong Bucawe, San Mateo Rizal. Here is a sneak peek on the things that happened in the event. Thousands of participants joined the 2013 Merrell Adventure Run. Many considered it the toughest outdoor trail run ever. Crawling through mud pits is just one of the challenges that the runners had to endure. 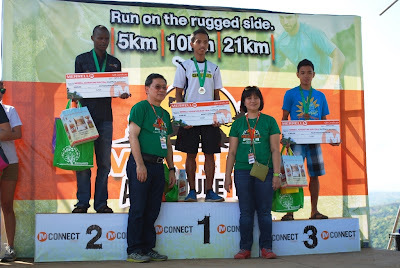 The 2013 Merrell Adventure Run sponsors helped in making the event a success. The newest shoe line from Merrell - the M-Connect Series. 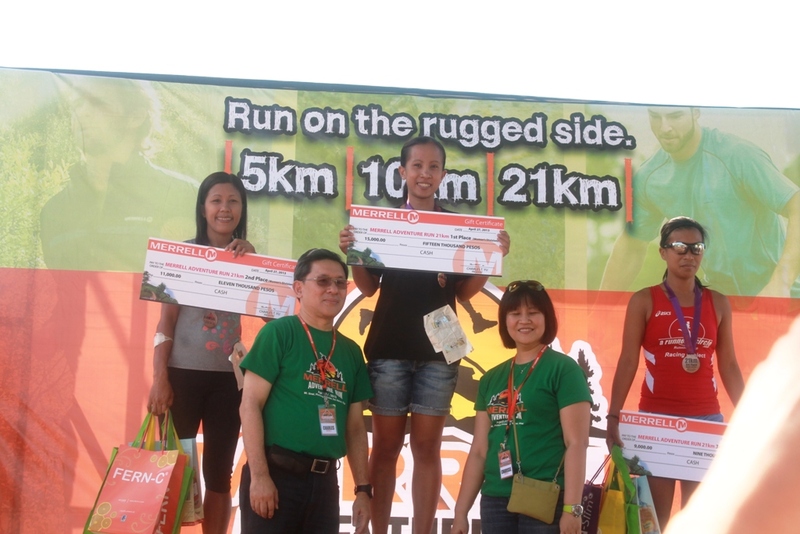 Women's 10k Winners (L-R) Janette Lumibao (2nd), Flordeliza Donos (1st) and Michelle Devera (3rd) with Merrell President Charles Yu and Concession Manager Charissa Aquino. Women's 21k Winners (L-R) Luisa Raterta (2nd), Miscelle Gibuena (1st), and Janette Agura (3rd) with Merrell President Charles Yu and Concession Manager Charissa Aquino. 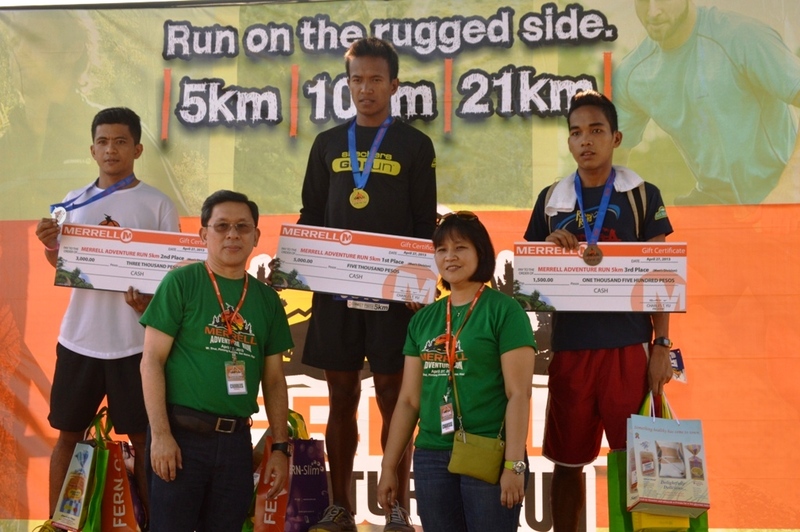 Men's 5k Winners (L-R) RG Lumawag (2nd), Patrick Gongob (1st), and Loweman Estrella (3rd) with Merrell President Charles Yu and Concession Manager Charissa Aquino. 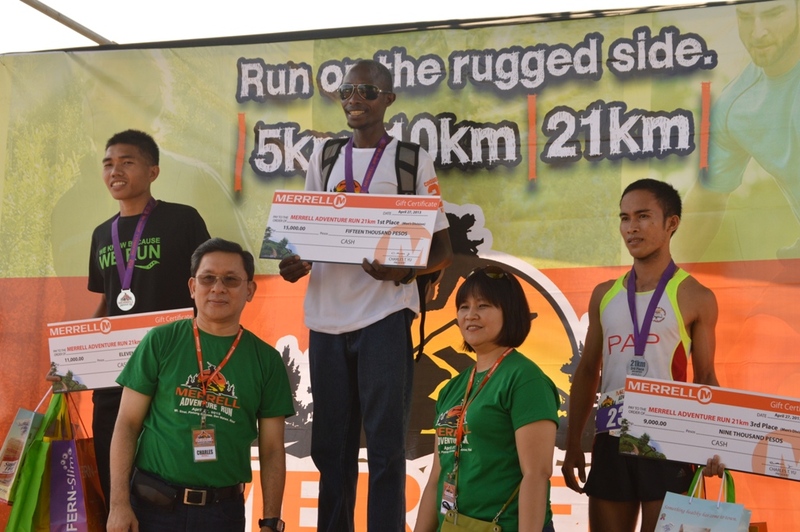 Men's 10k Winners (L-R) Benjamin Kipkazi (2nd), Richard Salano (1st), and Gregg Vincent Osorio (3rd) with Merrell President Charles Yu and Concession Manager Charissa Aquino. 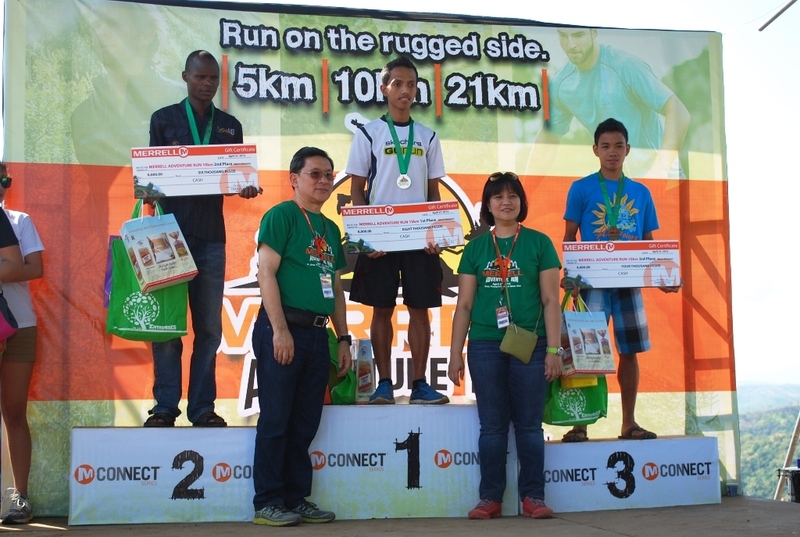 Men's 21k Winners (L-R) Rafael Poliquit (2nd), Willy Rotich (1st), and Bonifacio Monjas (3rd) with Merrell President Charles Yu and Concession Manager Charissa Aquino. Thousands of runners recently hit the trails of Mt. Sinai in Bukawe, San Mateo, Rizal for the 4th Merrell Adventure Run. This year’s trail again proved to be even more exciting as it became the toughest Merrell Adventure Run thus far, with a route filled with adrenaline-pumping obstacles - flowing streams, dirt roads, rock scrambling, river crossings, mud pits, and uphill & downhill paths. The Merrell Adventure Run is the pioneer in Philippine trail runs, which continues to inspire athletes who love the outdoors to conquer new adventures. “It was a very challenging trail run this year. Running upwards a high, long and steep hill was difficult. 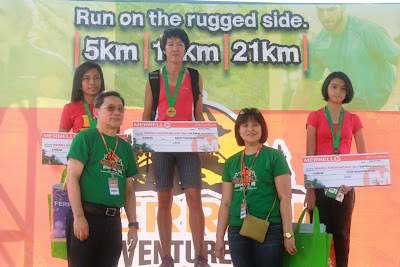 It’s a real test of physical endurance and sheer will,” exclaimed Miscelle Gilbuena, 1st placer in the women’s 21km trail run category. The event also saw the launch of Merrell’s newest shoe line, the M-Connect series composed of four key collections: Barefoot, Bare Access, Mix Master, and Proterra. Participants gave good feedback on the M-Connect series as it addressed their needs, as well as the demands of the outside activities while giving them a “minimalist feel” that allowed them to connect better with the ground. Trail-runners who tried the Merrell Barefoot Trail Glove 2 favored the shoes’ heightened ground feel and secure fit, which they agreed is perfect for races. They also liked the new upper material, which has microfiber and breathable air mesh. On the other hand, runners who preferred more cushioning chose the Merrell Bare Access, which provided utmost comfort with its M-Bound cushioning, as they tread the tough dirt roads. Runners who opted for the Merrell Mix Master collection, ideal for multi-run use, offered the best of both worlds – shoes that are lightweight and flexible. The Mix Master Move with its sticky rubber sole grips and Mix Master Tuff made specifically for hiking, provided better traction and stability during the runners’ steep climbs and descent. Meanwhile, runners who wore the Mix Master 2 were won over by the shoes’ durable and waterproof upper, ideal for both trail and road running. 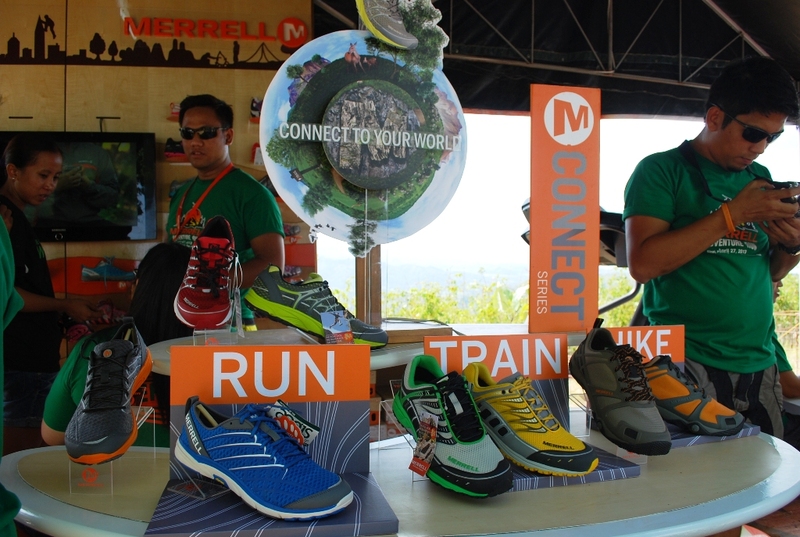 Lastly, runners who go for multi-run and multi-hike activities, chose the Merrell Proterra. This model features Merrell’s Stratafuse technology, which offered runners a lightweight fit and the ability to move more naturally during the race. 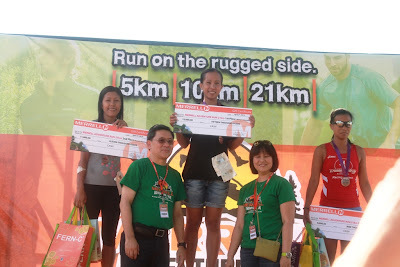 The 4th Merrell Adventure Run was sponsored by Fern-C, Jam Liner, Aquabest, Walter Bread, Orion Hotel and media partners Philippine Star, Clavel, MultiSport, Health Today, and Moms Today. 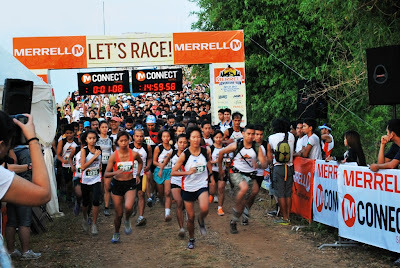 Stay tuned for the next Merrell Adventure Run by visiting www.facebook.com/MerrellPhilippines or by following them on Twitter, @MerrellPH. Madali nga daw to.... JOKE!